It seems like all of my friends are having babies lately! When I am invited to a baby shower, I love to give a personalized, one-of-a-kind gift. 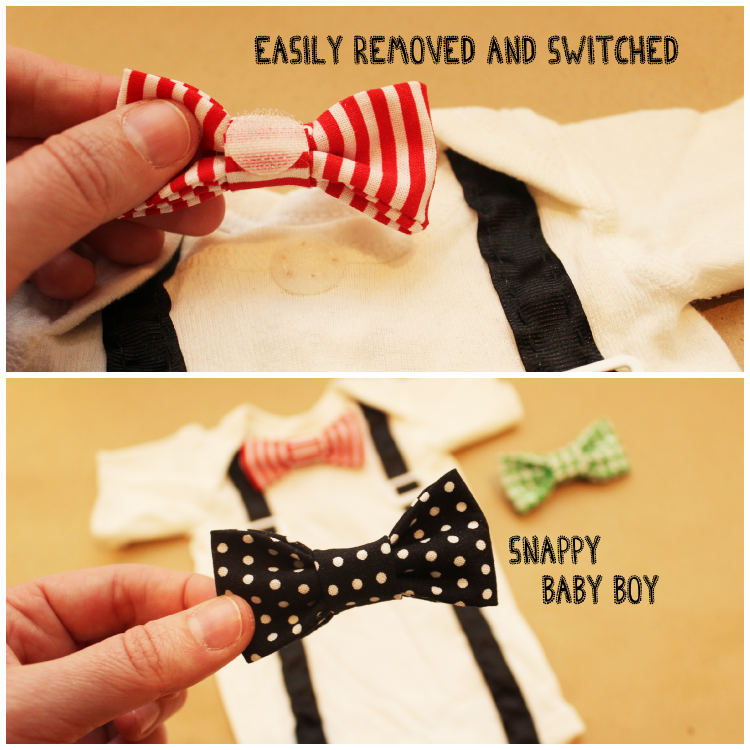 This DIY onesie fits the bill perfectly for a little baby boy! 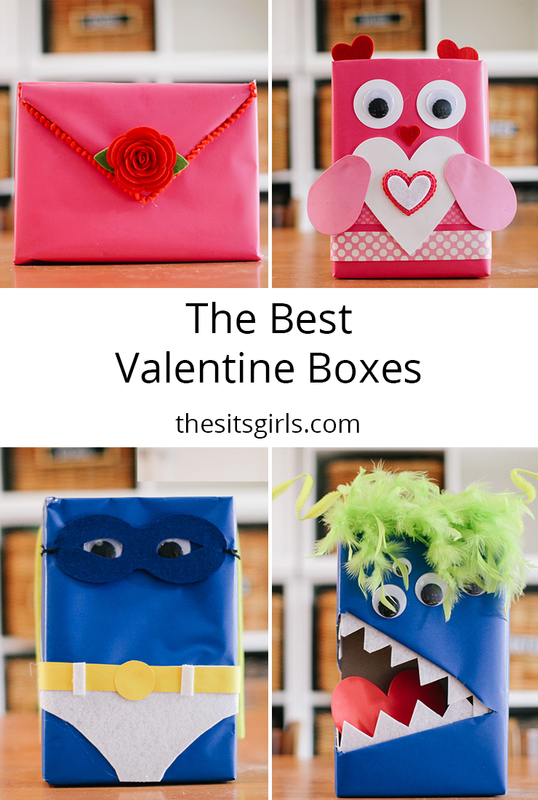 And, all they require are a bit of ribbon, a little fabric, and a needle and thread! And don’t forget to link up your craft or recipe post at the bottom of this post. Last week we had 91 people link up their posts! Things that might be useful to have on hand would also be a glue gun and some glue sticks. 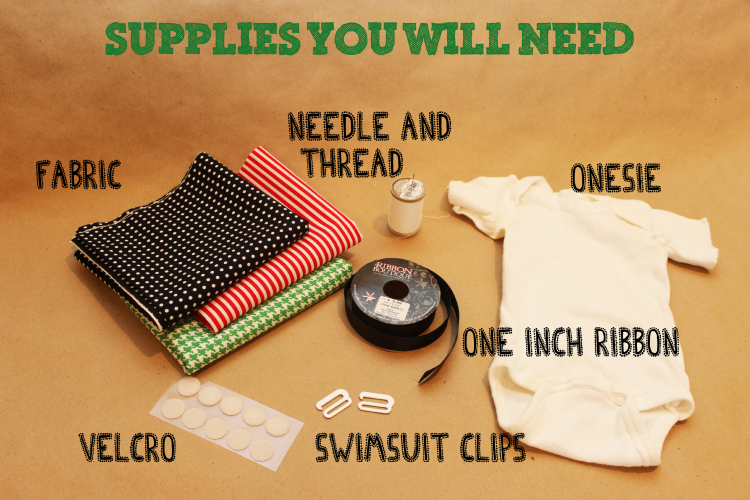 I sewed my onesie by hand, but if you have sewing machine skills, feel free to zip through this project on your sewing machine! Swimsuit clips are used to give the ribbon a faux suspenders look. They are easily found at any craft shop in the sewing notions. You could also use small metal D-rings. To begin, cut a piece of ribbon longer than the length of your onesie and pin lengthwise along the area where suspenders would fall. 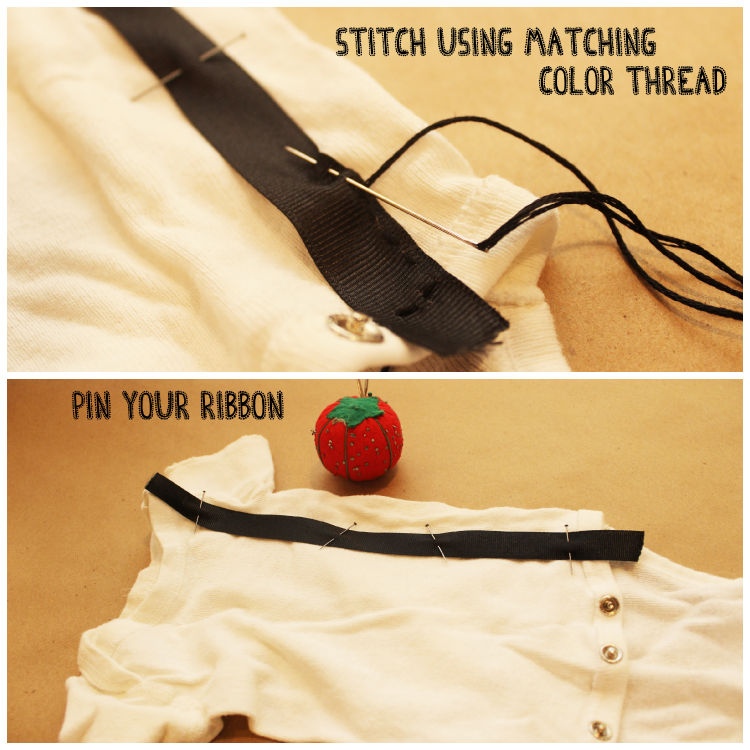 Stitch your ribbon using a matching thread. I went with a classic black ribbon, but you could choose any color or patterned ribbon that you desire! Slide your swimsuit clip onto your ribbon and place it so that it falls at about 1/3 the length of your onesie. Sew into place. Once you’ve finished sewing on your ribbon, trim the ends. You can add a bit of fray check to keep the ends from unraveling. 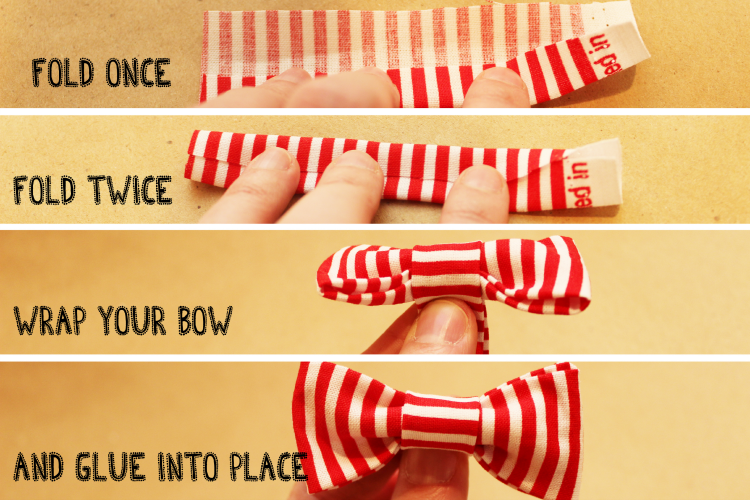 To begin your bowtie, cut a piece of fabric to form the bow. I cut a piece that was about 6 inches by 3 inches. 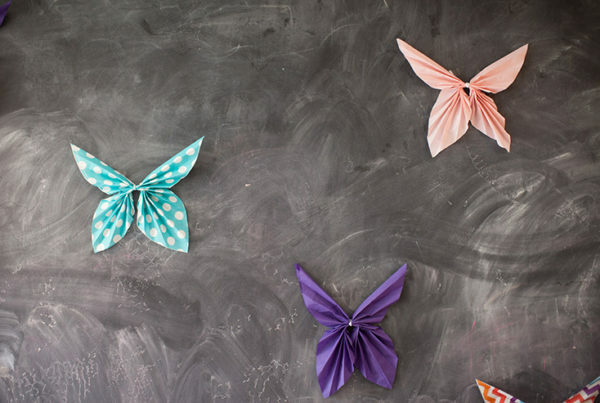 Fold the right sides together and sew. Sew along one side and one end. Keep one end open. Turn your bow tie right side out and pick out the corners. Smooth out the wrinkles. 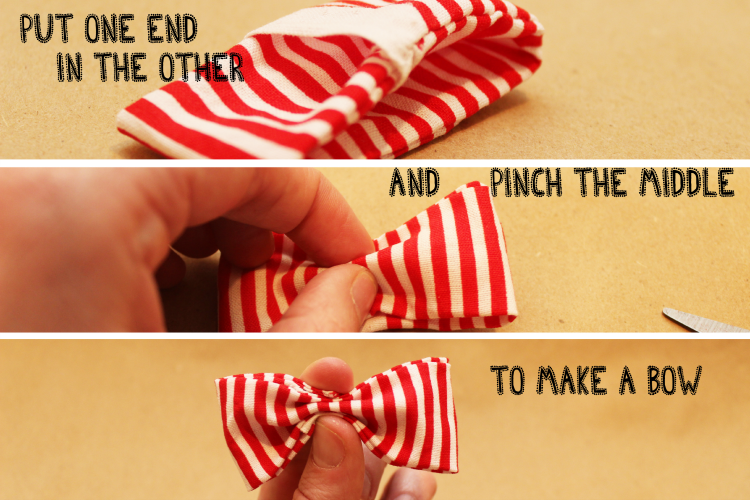 To form your bowtie, place the sewn end into the open end and pinch the middle. Next, cut a piece of fabric that is about 4.5 inches by 2 inches. 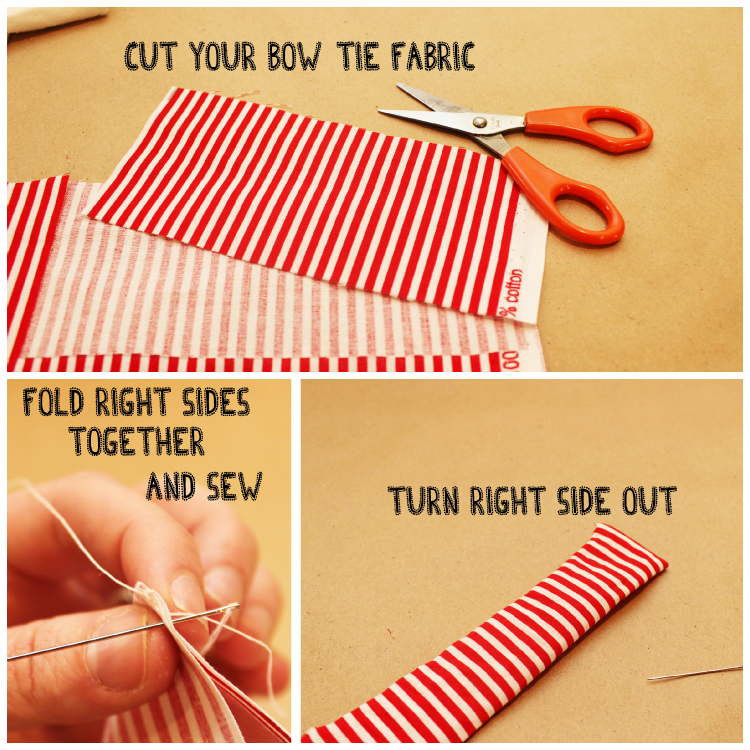 Fold both sides in to form the middle of your bow tie. Wrap your tie in the middle and glue it into place. Trim the excess fabric, fold and glue. 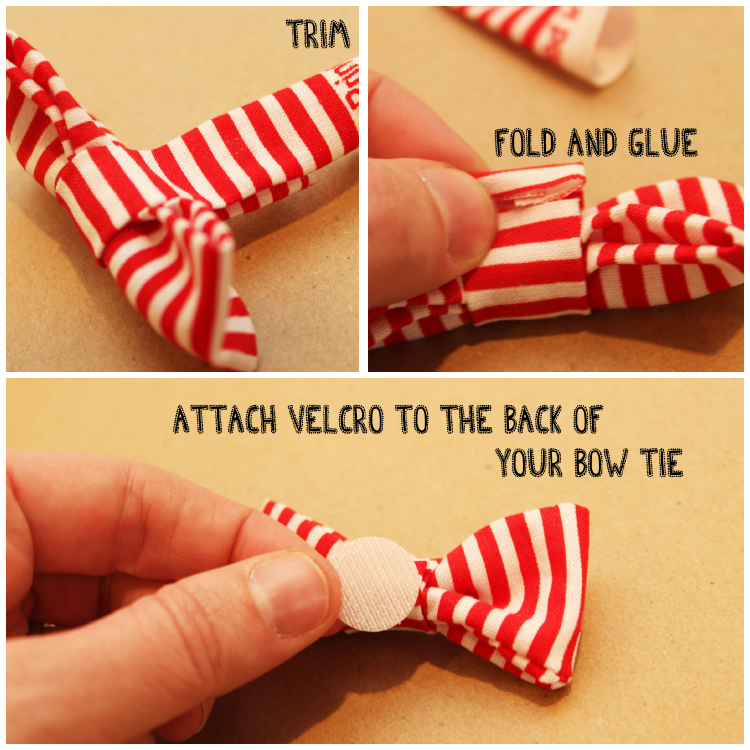 Attach the scratchy sided Velcro to the back of your bow tie. 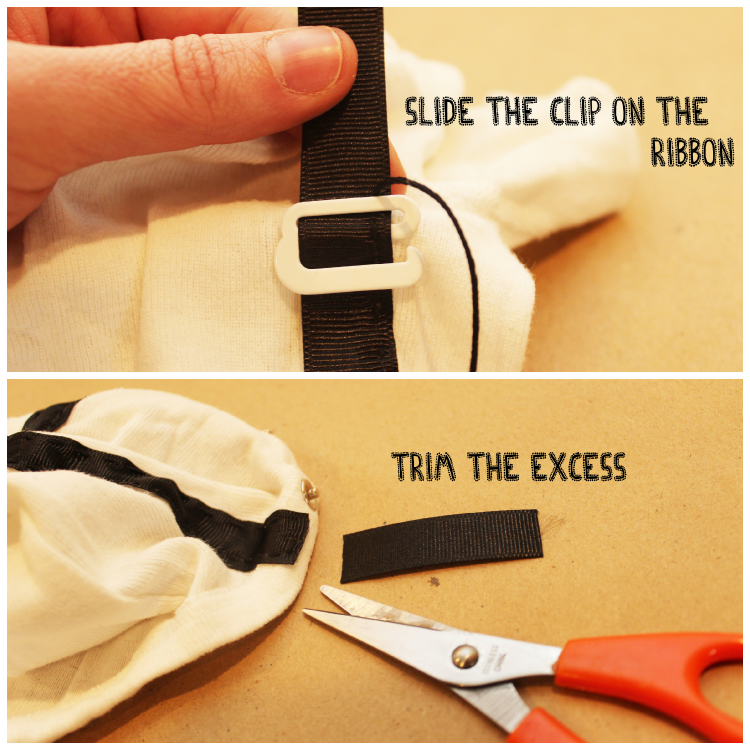 Attach the soft sided Velcro to the front of your onesie. 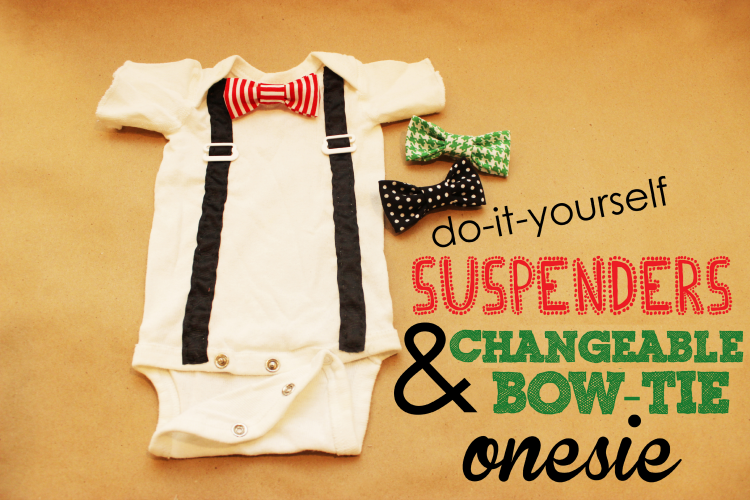 The best part of this onesie is the fact that you can change out the bow ties because of the Velcro feature! 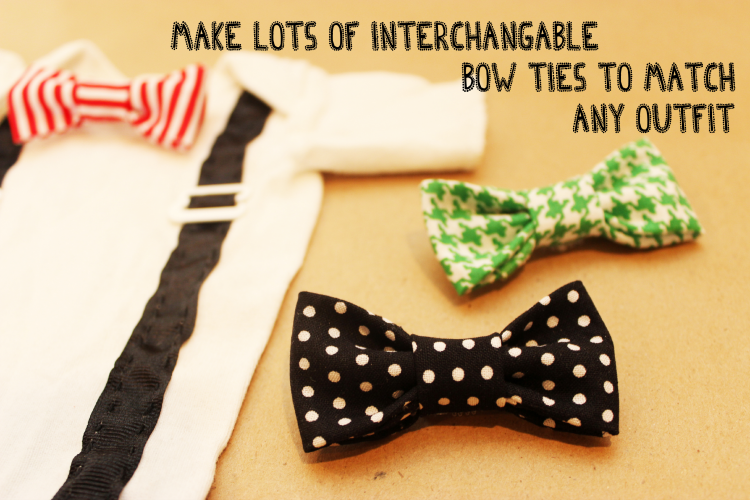 You can make as many interchangeable bow ties to go with your onesie as you wish! The bow ties can be removed for easy laundering as well. 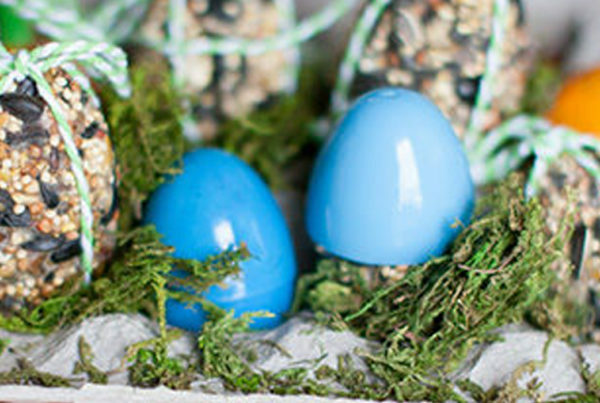 When looking for a creative baby gift, look no further! This DIY decorated onesie fits the bill! And, it’s not only cute, it’s easy! Thank you so much for the link-up!!! Happy Mother’s Day! That’s such a cute baby onesie. Love the removable bow tie. Thank you for hosting this link up. Darling!! I wish I knew someone having a boy!! This is so cute. I must remember for the future! That onesie is totally precious! Thank you for all that you guys do and for hosting the linkup! Stop. It. Insanely adorable and looks easy enough for even me to try 🙂 Thanks for a great tutorial!! What an adorable onesie idea! Thanks so much for hosting and for the feature this week! Have a great week! Such a cute onesie idea, lovely. I especially like all the bow tie options!